You’ve probably heard all about the benefits of solar power, but it wouldn’t be fair if I didn’t mention some of the down-sides. Overall, every project or home will be different and it’s up to you to decide what makes the most sense. The biggest downside to solar energy is the toxicity of production of the panels and especially the batteries. Most of the panels and batteries are made of or produce heavy metals like silicon, mercury, lead and cadmium. Mercury: The manufacturing of photovoltaic cells produces some mercury which is highly volatile and can be very harmful to the environment. Lead: deep cycle batteries are required by solar arrays to ensure a constant supply of power (even when the sun has gone down). These batteries contain lead which is highly toxic and can lead to damage of marine life and even children. Cadmium: Cadmium is sealed inside the solar panels and is harmless, but if leaks, can cause serious environmental damage. If Panels are disposed of properly, this substance can leech into the soil and water causing major damage. Carbon Emissions: Solar energy’s biggest hurdle is that it often needs regular electricty (Coal, Oil) to aid in the production of it’s panels. Solar energy is not at a place where it can self-sustain. One way to reduce some of the environmental impact of solar energy is to choose grid-tied technology over off-grid technology. This means your solar energy is tied directly to your electricity and eliminates the use of batteries. After doing extensive research on this subject, it seems most experts agree that while the construction of solar panels requires the use of some heavy metals, coal and oil require the same metals, and at a much higher rate. “While manufacturing the cells does require harmful metals such as lead and mercury and also produces some greenhouse gases, the toxic emissions are up to 300 times lower than those created by coal power plants, according to scientists with the Brookhaven National Laboratory in New York.” They also agree that any carbon emissions produced by the manufacturing of these solar panels would be offset in as low as 3 months. Check out this article for more information. Even residential systems require a large surface area of solar panels to be effective. In today’s world of high energy needs this can mean a lot of space being used up. The other problem is that some high energy sources (air conditioners especially) need an enormous amount of energy to run. When designing your home or business it is recommended that you keep air flow and shade in mind to minimize the need for such power. 3. Crystalline or Amorphous Silicon? Silicon can be used in it’s various states for solar panelling. These states can vary in quality and price. It is up to the consumer to be aware of the price differences as well as the efficiency rates. It’s important you ask your installer or manufacturer what type of silicon you are getting and that you understand that a lower cost will likely be a lower grade of silicon. 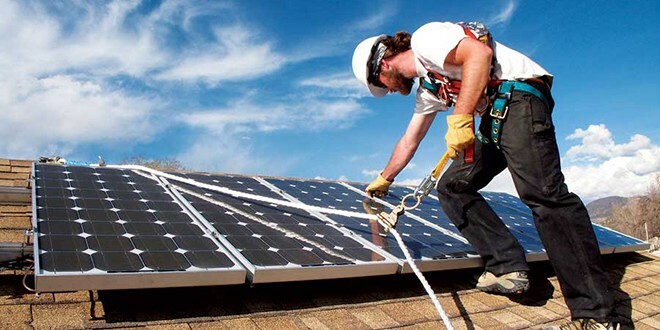 The maintenance on solar panels can depend a lot on the region you live in. If you live in a windy or dusty are you may need to clean your panels once a week. Most areas need to be cleaned a few times a year. For some people this is too much maintenance. You try to power wash your panels but sometimes this could be hard to manage. many companies suggest having solar panels be placed somewhere accessible but this obviously poses questions and concerns about space and the fragility of the panels. Many people think that hiring someone to clean your panels is the best solution. In the July 25 issue of Solar Energy by the University of California, San Diego, they strongly advised against doing that..
“Researchers found panels that hadn’t been cleaned, or rained on, for 145 days during a summer drought in California, lost only 7.4 percent of their efficiency. Overall, for a typical residential solar system of 5 kilowatts, washing panels halfway through the summer would translate into a mere $20 gain in electricity production until the summer drought ends—in about 2 ½ months. For larger commercial rooftop systems, the financial losses are bigger but still rarely enough to warrant the cost of washing the panels. On average, panels lost a little less than 0.05 percent of their overall efficiency per day. One of the main disadvantages to solar energy is the high up front cost. You must purchase the panels, have them installed, and maintain them properly. Even though experts agree that you are likely to cover your costs in less than 10 years, it can be daunting to the single home or business owner. Right now ICE is in the middle of a pilot program but will not purchase power back from you. If you tie onto the grid and create extra power during the day, they will credit you but not buy it back. If you decide to go off grid you will need to make sure you have enough power and panels to sustain yourself on days when there’s no sun. In Costa Rica, a new company is now offering “free” solar panel installations for qualifying homeowners and businesses. They will install and maintain your system, and sell the power to you at a lower price than you’re paying with local power company (ICE). There’s no way around the fact that solar panels are just plain ugly. Only a serious eco-geek looks at a house covered with solar panels on its roof and thinks it’s beautiful. Particularly in Costa Rica, where everything is so beautiful and wild, those ugly bright shiny blue rectangles are a serious eyesore that really stand out against a nice spanish-style roof or the green jungle. Greenbuilding should make a house more livable and beautiful, so how to get around this problem? Companies are working on other types of panels, but for now, we’re pretty much stuck with these things the way they are. One option is to put them on a carport rather than on your roof, or to mount them on the ground on posts. Consider building some type of shade structure, such as a gazebo, perhaps covered by plant walls, with the panels on top of it. Nearly every month, a new solar power start-up announces a breakthrough technology that solves one of solar power’s biggest drawbacks, such as new cells that double the power output, or non-toxic panel production, or drastically lowered prices. Every year, huge worldwide competition for solar has been lowering the price, so it’s tempting to just keep waiting for a better technology to come around before you invest and get stuck with obsolete technology that you end up wanting to replace a few years later. This is particularly true because a solar power installation takes so many years to pay itself back. So, think of solar power as a long-term bet and if you’re happy with today’s tech over the lifetime of the system to pay it back, then go for it now. Otherwise, keep waiting because, like computers, this stuff keeps getting rapidly better every year.